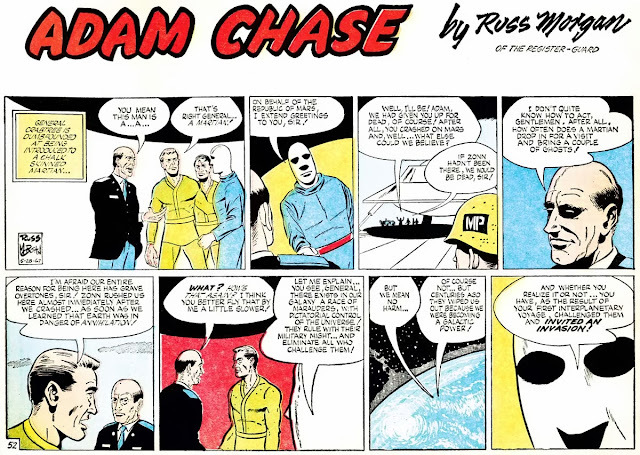 Adam Chase strip #52, originally published May 28 1967. For background on the strip and creator, refer to this post. First the short version -- due to circumstances beyond our control, the second year of the Adam Chase comic strips, which complete the storyline and the run of the strip, is unavailable to run on Stripper's Guide. Russ and I apologize that we are unable to bring you the conclusion of the strip. Russ will provide a synopsis of the second year's storyline at the conclusion of this series, which ends with installment #52. And here's the long version. Before we began running Adam Chase on the Stripper's Guide blog, Russ sent me the first year's worth of strips to scan. He believed that the second year of the run was in his attic, in the form of black and white proofs. We decided to see how things went with the first year, see if people liked it, before troubling Russ with the job of playing archaeologist up in his attic. Recently Russ did go on an expedition into cobweb land to retrieve the second year. Unfortunately to his surprise and dismay he was able to find only a little more than half the proof sheets for year two, not nearly enough to keep running the series. Russ is very unhappy that his archive turns out to be incomplete, and I'm saddened that we can't bring you the rest of the series. That is, barring the miracle that someone out there has the tearsheets and is willing to lend them to us for scanning. I considered the possibility of pulling the missing episodes from microfilm, but then I realized that since they were run in color, the quality coming from microfilm will be really awful, if even legible, so that's no solution. I hope you will accept the apologies of Russ and I. Having gotten you interested in the story, we know this is a big disappointment. Please keep in mind that I am just as disappointed as you, and Russ even more so at the loss of his archive. I hope you'll join me in letting Russ know that we really enjoyed year one of his delightful strip, Adam Chase.Your feedback in the comments would be much appreciated. PS -- On a side note, this leaves the Stripper's Guide flat-footed as regards the future of Sci-Friday. I had expected to have another full year of material for it, and so have not until just now bothered to think of what we might run instead of Adam Chase. I certainly don't have a long run of any sci-fi oriented strips that come to mind, at least nothing that suits our needs here. We need a feature that is well and definitely out of copyright, or comes with permission from the copyright holder. Also, it has to be something that isn't already readily available elsewhere on the web. Anyone have any ideas, or better yet ideas that include source material I can borrow to scan? ~ Allan, so sorry to hear about the second year of Adam Chase. I've enjoyed it so far. How about Basil Wolverton's "Spacehawk" as a replacement? Love the art but maybe it's already available. Sorry about the change with Adam Chase. I don't have any copies myself, but what about Stanley Pitt's "Silver Starr?" I remember reading those years ago in Captain George's Comic World and being very impressed with the Alex Raymond-style artwork. Silver Starr is Australian, although it did feature in a small run of New Zealand comic books. I wouldn't consider it public domain, From what I gather the Captain George reprints were unauthorized and the copyright on Silver Starr is retained by Pitt's family.